These conditions, if unchecked can compromise the security of lacs worth of equipment in the shelter and more importantly will lead to break in service and hence dissatisfied customers. Keeping the above in mind, we have developed a comprehensive solution that incorporates all the features in a single box that operates on 48V DC. If the temperature in BTS shelter goes beyond the User defined temperature cut-off then the Temperature LED lights up on the central panel and Buzzer starts sounding. Also, the NMS is activated. 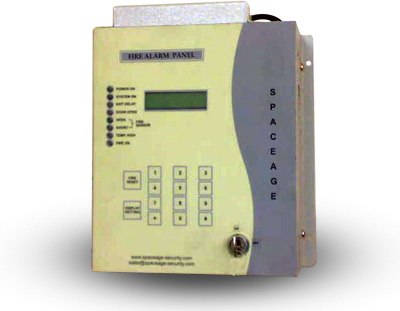 Fire detection is done using a standard Smoke Sensor that is interfaced with the Central Panel. In case the wiring of Smoke sensor is Open or Short then corresponding LED lights up and buzzer sounds. The LCD display also displays the OPEN/SHORT message. RESET button is provided for resetting Fire indication. Intrusion is detected using a magnetic switch that has to be mounted on the door of the enclosure. When the door is opened, the Door LED lights up on the central panel and Buzzer starts sounding. Also, the NMS is activated. The user has to enter the 4 digit Password to deactivate the buzzer and NMS. Four digit Code has to be entered on the keypad provided to detect authorized entry. This is factory preset to 1234. User can change the password of each panel by going into programming mode without the need to open the panel. Door Sensor	:	Magnetic Door Sensor, 1 No. Temperature Sensor	:	RTD or Thermistor Sensor, 1 No. Panel Color Off white with polycarbonate front sticker. NOTE: We can customize the features, if desired. We have simple models too. We reserve the right to revise features at any time, without any prior notice.